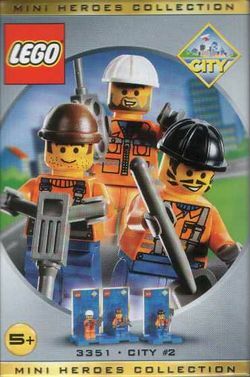 3351 Three Minifigure Pack - City #2 is a City Center set released in 2000. It contains 21 pieces which build three Construction Worker minifigures, a shovel, a jackhammer and a walkie-talkie. This set had a limited release and was available in the UK from the LEGO Shop at Bluewater, LEGOLand Windsor, and LEGO Shop@Home. Facts about "3351 Three Minifigure Pack - City 2"
This page was last edited on 9 January 2016, at 09:41.